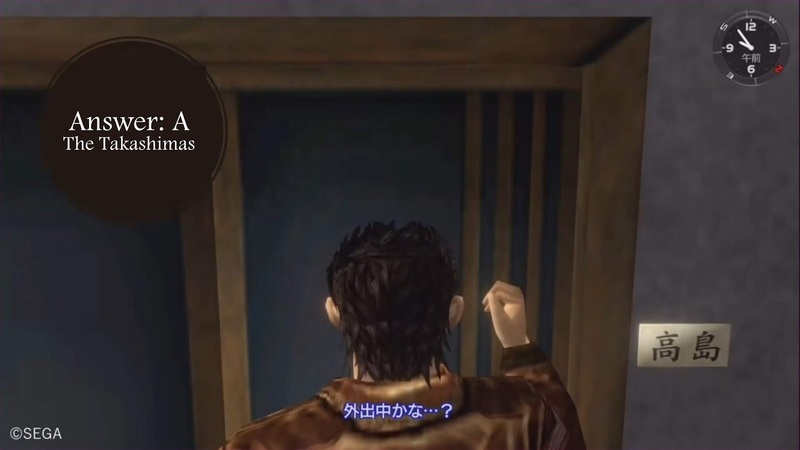 A special Shenmue quiz was held at last month's Shenmue Fan Meeting that was held on Christmas Eve in Yokosuka. The quiz was entitled "How About Trying a Mega-Tough Quiz?" 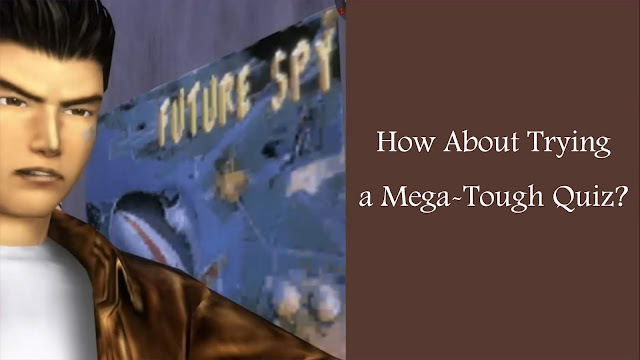 (naturally, spoken in the vein of the owner of a Lucky Hit game trying to attract customers!). 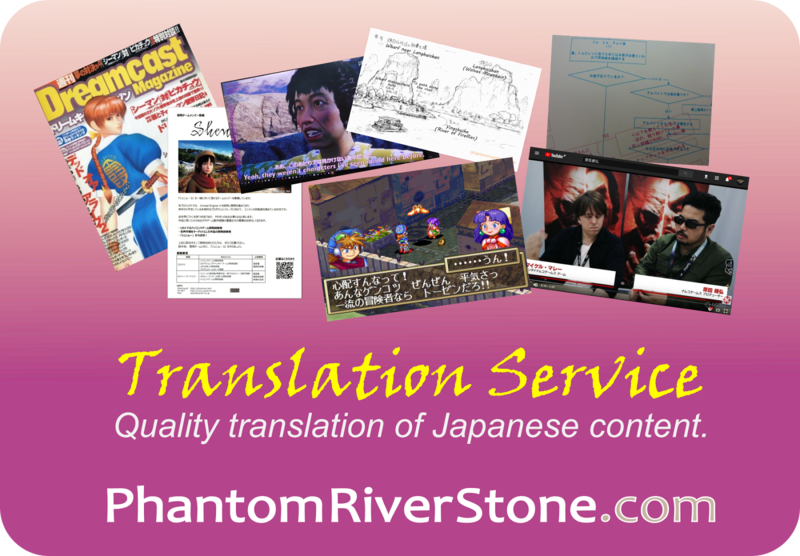 In this post we present the translated quiz questions so you can try for yourselves (answers are hidden in spoiler tags). 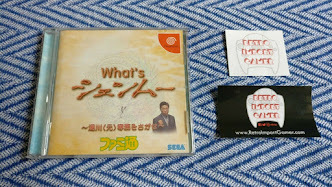 The quiz was devised by the MC for the event, Esra Krabbe of IGN Japan (who in fact organized the entire event together with Yokosuka City), with the promise that all the questions, while not easy, are potentially all answerable if you are familiar with through the games. Give it a try, noting down your answers as you go. 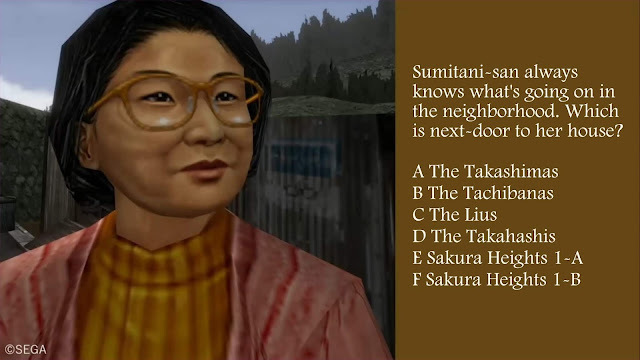 The answers follow the end of the questions, of which there are 6 in total. 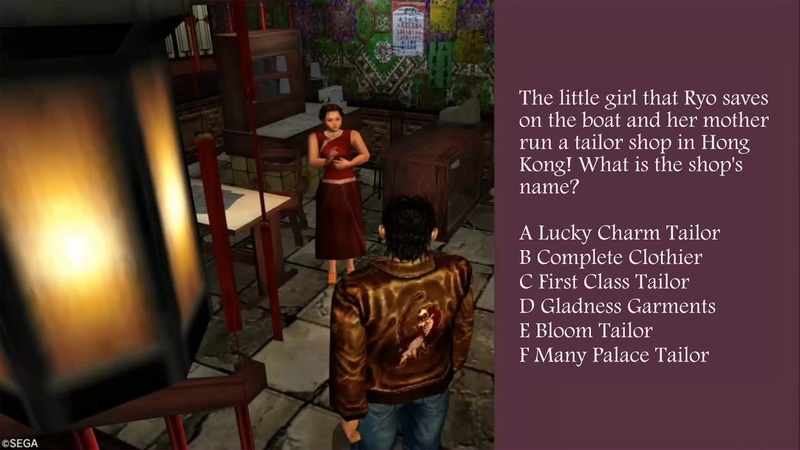 Next, a question from Shenmue II, referring to the mother and child whose acquaintance Ryo makes on the boat on the way over to Hong Kong. 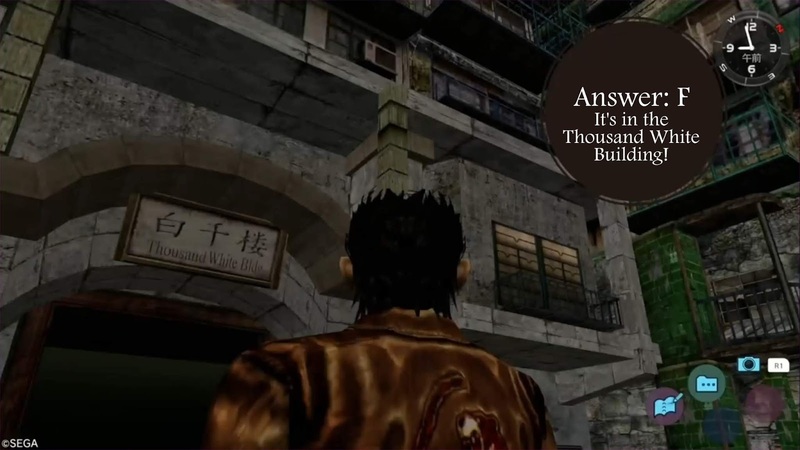 (The boat trip itself was cut from the main game but is described in the Shenmue Side Story manga). 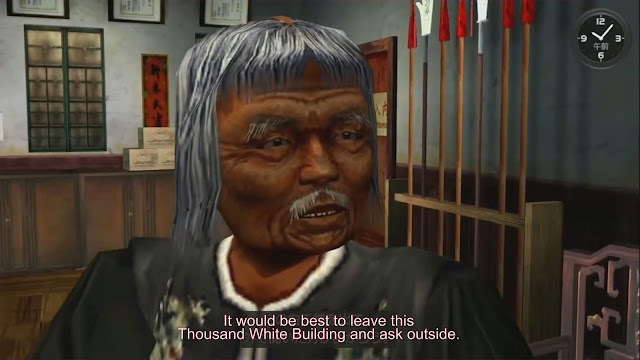 How well do you know the backstories of the residents of Yokosuka? If you have done a lot of exploring of the buildings in Kowloon you are sure to know the answer to this one. This was the last question of the official quiz, about a well-known gossiper, who lives at the top of a dead-end road in Sakuragaoka. (To help decide the winner at the event, this question was allocated a weighting of two points for a correct answer, rather than the single point of the previous questions). This last question was a bonus time-filler at the event. The correct answers to the quiz questions follow. 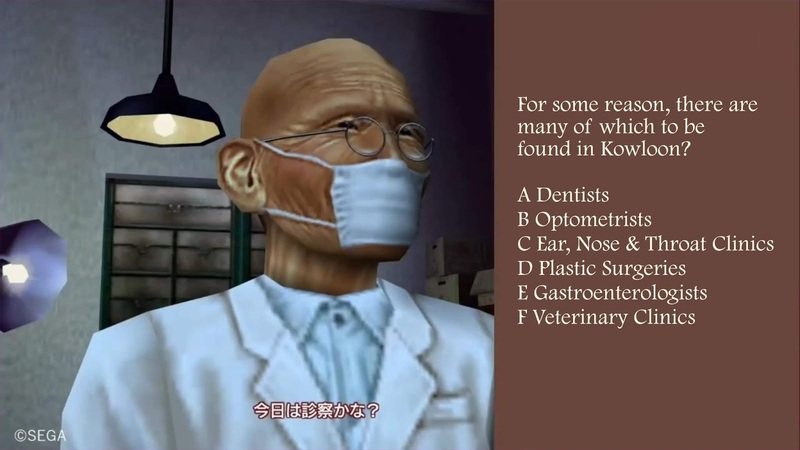 Proceed only once you have completed the quiz! 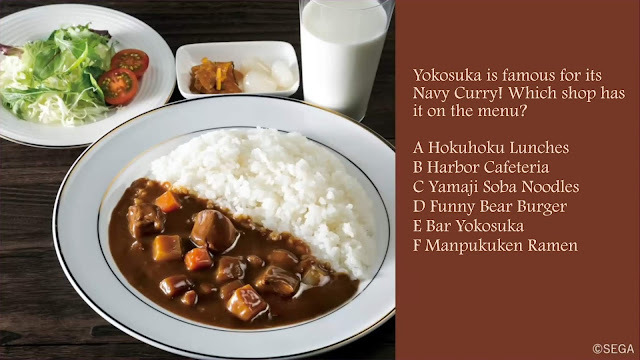 The shop that has Navy Curry on its menu is... the Harbor Cafeteria. 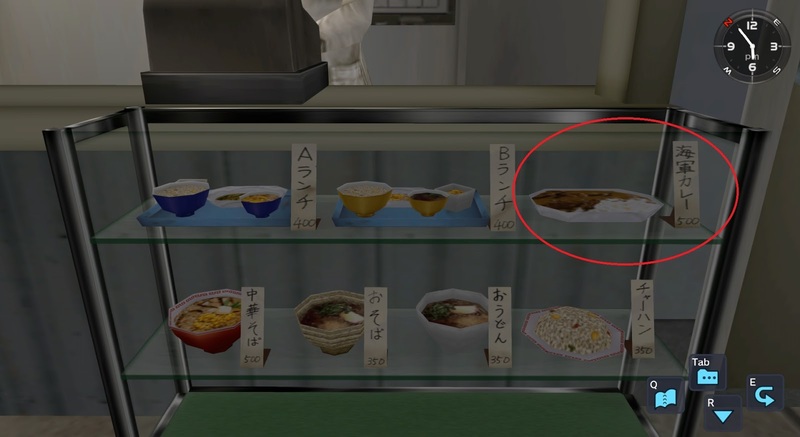 The curry is not mentioned during Ryo's conversations, however for those not able to read the Japanese menu, there is another hint present in the game: if you examine the display in front of the counter, it has replicas of all the dishes, including the Navy Curry at the end of the top shelf. One of the original Shenmue developers on-stage at the event, Hiroshi Noguchi, commented that it represents good value at 500 yen for such a large serving! 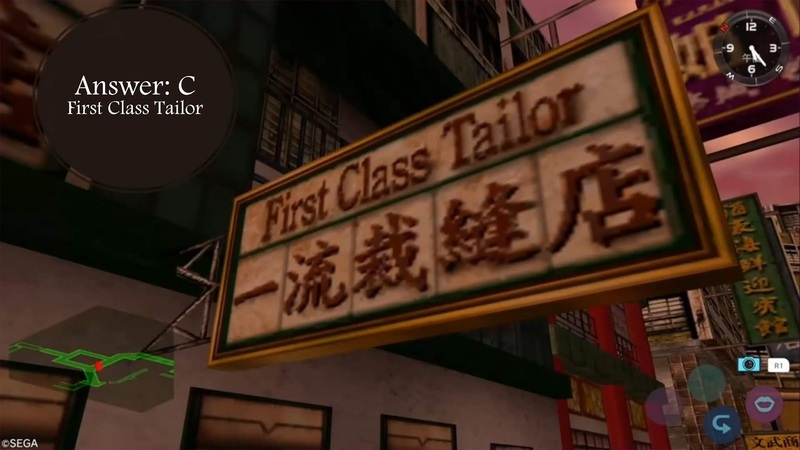 The name of the tailor shop that is run by the mother & daughter that Ryo meets on the boat is... First Class Tailor. At the fan event the voice actor for Ryo in Japanese, Masaya Matsukaze, confirmed that he did indeed have to voice the name of every single shop in the game (for when the player examines a sign). At the time he didn't realize that this was rather unusual, as he was just starting his career. 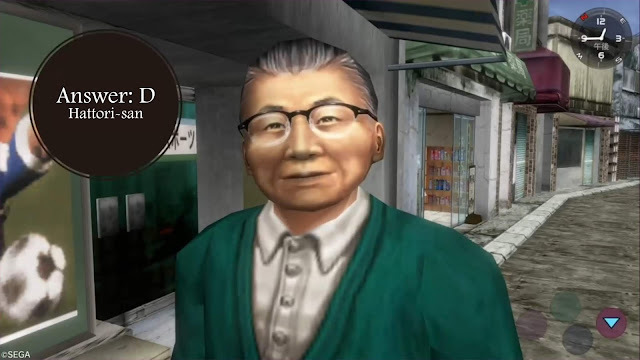 The chairman of the Neighborhood Association in Dobuita is... Hattori-san. This fact is mentioned by the owner of the Uokichi Seafood shop during Ryo's questioning around Dobuita. It is also in the character profile for Hattori-san in certain Japanese guide books, but appears to have been omitted from Hattori-san's backstory in the English guides. 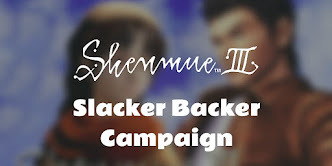 At the fan meeting event, the developers of the original Shenmue games agreed that the chairman of the Association being Hattori-san does not have any bearing on the story! 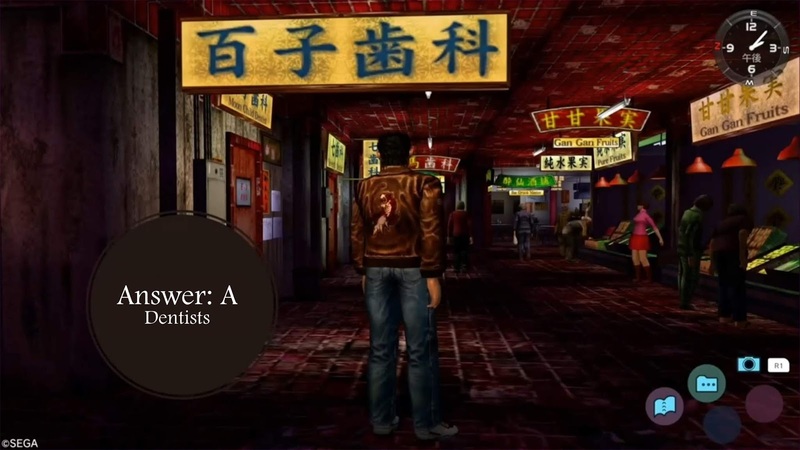 In Kowloon there seem to be an unusually high number of... Dentists. 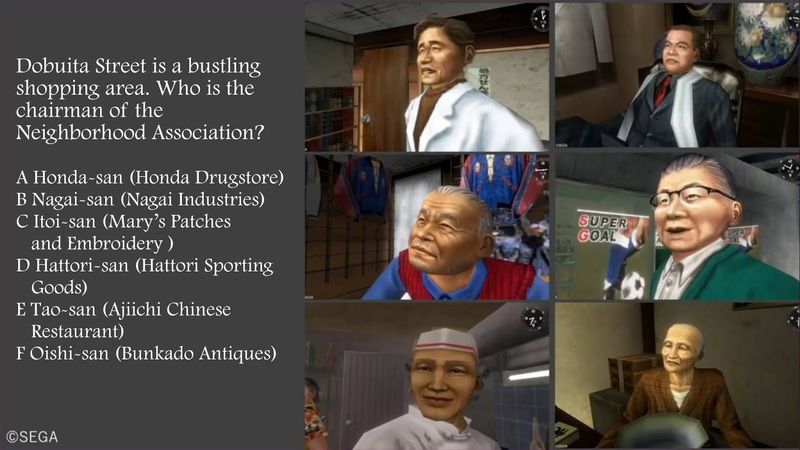 Eigo Kasahara, whose role was Planning Director on the original Shenmue games, explained that this is historically accurate. Noguchi added that dentists often went to work in the unregulated environment of Kownloon Walled City if they did not hold the proper license required to work elsewhere in British-ruled Hong Kong. 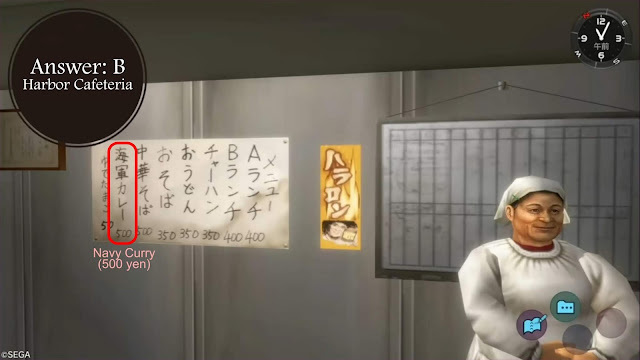 Next-door to Sumitani-san's house is... the house of the Takashimas (who never seem to be in when Ryo calls). 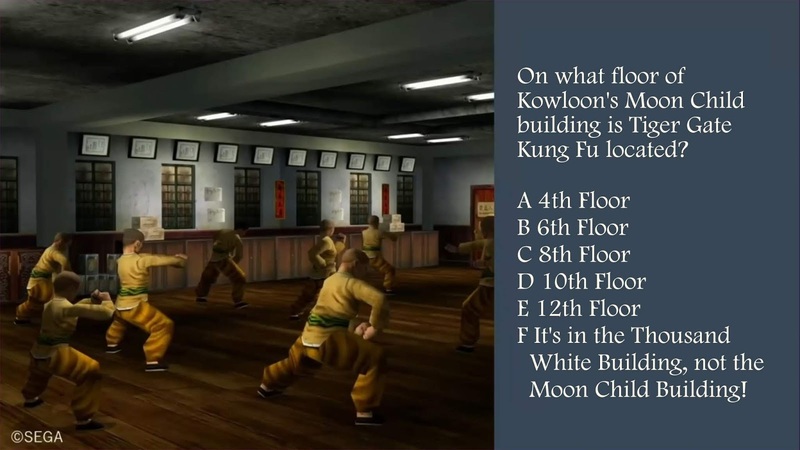 Hence the correct answer is that it is not located in the Moon Child building at all, but in the Thousand White Building (on the 6th floor). How many questions did you get?